The Civic 50 provides a national standard for superior corporate citizenship and exemplifies how companies can use their time, skills and other resources to improve the communities in which they do business. 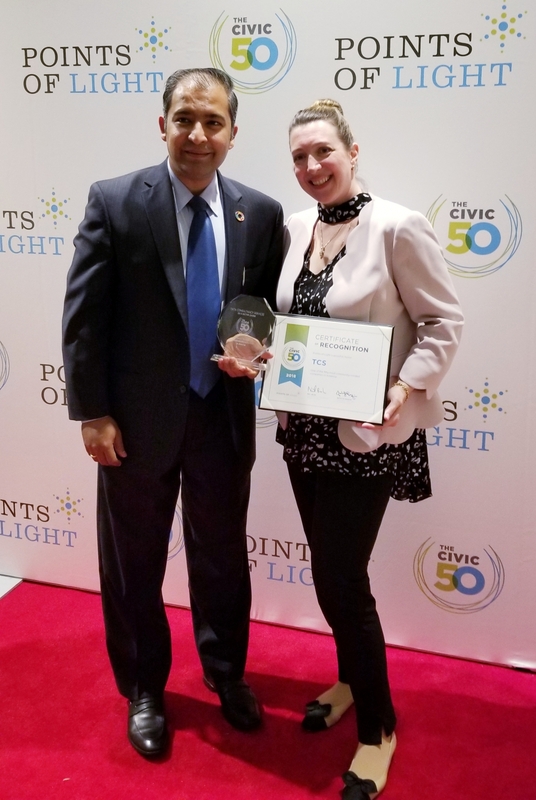 The Civic 50 winners were announced at the Service Unites 2018, Points of Light’s annual conference on volunteering and service in Atlanta, where cross sector leaders gathered to discuss social innovation, civic engagement and collaboration. With the advent of the Fourth Industrial Revolution, TCS’ Business 4.0 framework is helping leading U.S. companies to grow and transform their operations, services and customer experiences through the power of digital technologies. Similarly, TCS leverages its expertise, digital platforms and people to empower communities through its thought leadership forums, cross-sector collaborations, flagship programs, partnerships, and skills based volunteerism initiatives that address large-scale societal problems. TCS and the U.S. Chamber of Commerce Foundation recently hosted ‘Digital Empowers: Accelerating Innovation for Business and Social Good’ to explore the use of digital technologies like Artificial Intelligence, Analytics, AR/VR, Blockchain, Cloud, IoT, and Robotics in solving challenging social issues across health, education and the environment. Additionally, its partnership with the World Economic Forum on Closing the Skills Gap 2020 has already garnered commitments from 26 top global businesses to lead training, reskilling and upskilling initiatives for 8.1 million people between 2018 and 2020. Over the past decade, TCS has been a leading STEM education proponent through highly scalable cross-sector partnership and initiatives, such as US2020, STEMConnector®, Npower, CECP, and the U.S. Chamber of Commerce Foundation. TCS is also a founder and technology partner of Million Women Mentors (MWM), which has generated 2.2M+ pledges and 1M+ mentoring engagements to date, building bridges between career professionals and young women to be inspired, persist and succeed in STEM education and careers. TCS’ flagship student engagement program, goIT, has engaged more than 13,000 middle and high school students across 58 cities in the United States and Canada with hands-on experiences in computer science, app development and design thinking, with the goal of inspiring them towards tech careers in all sectors. To date, TCS employees have volunteered in excess of 33,000 hours toward pro-bono tech consulting projects, benefiting more than 250 nonprofit organizations and resulting in over $5M in social good. Moreover, 43 percent of TCS employees in the U.S. volunteer in their local communities, and TCS’ pro-bono technology projects with US2020, MWM, NPower, CSforAll, Impact 2030, 911 Day, and others have generated over $20M+ in social good. More recently, TCS launched Ignite My Future in School with Discovery Education in 2017, enabling educators, administrators and school districts to become ambassadors of a transdisciplinary approach to learning and introduce computational thinking within the context of core subjects such as English, mathematics, social studies, science, and the arts. TCS’ goal is to engage 20,000 teachers and one million U.S. students by 2021. The program has already provided free, in-person professional development to educators from U.S. school districts across Washington D.C, Maryland, Virginia, Texas, Pennsylvania, Wisconsin, North Carolina, and New York City as early adopters of this transdisciplinary approach. Since September 2017, the program has engaged more than 3,300 educators from every state and impacted more than 185,000 students. To help address the issue of heart disease and encourage a healthy lifestyle, TCS is a National Corporate Team Walk and National Wear Red Day Partner with the American Heart Association (AHA). More than 16,000 employees across 110+ cities have supported the cause, positively impacting thousands of lives. TCS also has a long standing partnership with the American Red Cross in the U.S., and more than 4,000 employees have come together to support rescue, recovery and rehabilitation efforts during disasters.